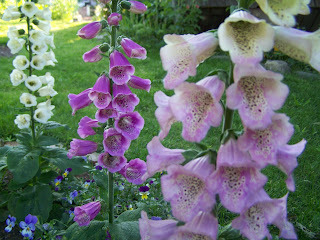 Foxglove are blooming right now in my yard. 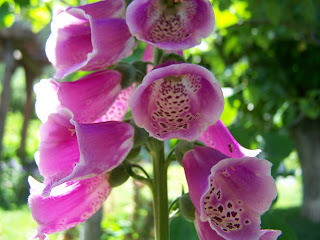 I love these flowers. (which kind doesn't she love?) For a few years I had to rip them all out to make sure my youngest wouldn't end up eating them but now they are slowing making their way through the gardens again and I couldn't be more pleased. I was telling a friend that I had a few colours back again but I couldn't remember the colours. Yesterday I went out to take some pictures and found purple, light pink-ish purple, light yellow - almost a butter colour, and white. 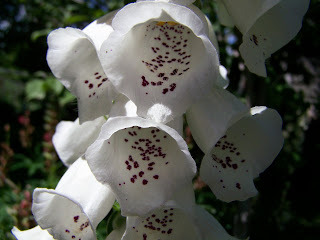 I quite like this white one because it has dark burgundy spots inside. oh Heather! I get such joy just from my two little plants growing (and what fun to find that third completely unexpectedly!!) I think I would be in constant ecstasy living in your gardens... What beauties!!! 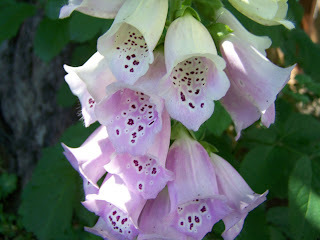 Foxgloves are supposed to be like a healing balm for pines, so I have dreams of scattering buckets of seeds of them someday!